These images show a promotional post card produced for the Corner Drug Store owned by George K. Crooker in Anthony, Kansas. 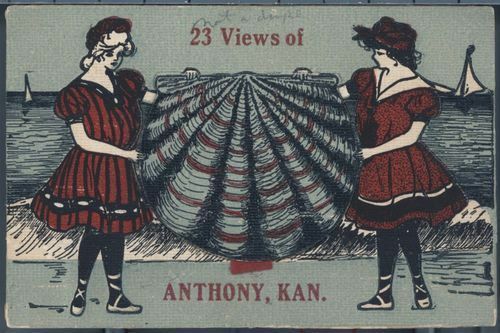 The post card shows a drawing of two women holding a large sea shell. The shell on the card opens to reveal a miniature folding photograph album containing 23 views of Anthony.